Published: April 22, 2011 at 03:28 a.m. 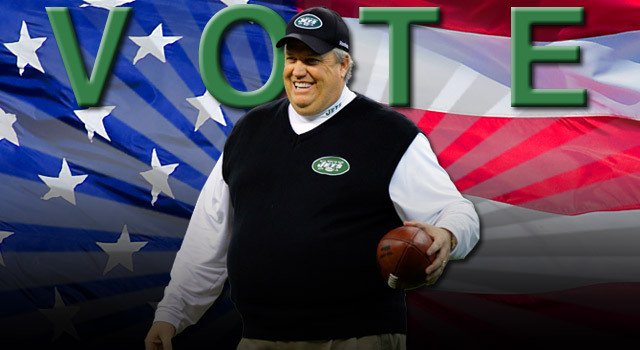 Jets linebacker Bart Scott last week, while defending coach Rex Ryan's outgoing nature, compared his coach to President Barack Obama. And while we started thinking about how great a president Ryan would make, President Obama's motorcade rolled near the NFL Network studios in Culver City, Calif. Which, we have to admit, was kind of cool. But before we replace the presidential top hat with the presidential sweater vest and make Fat Tuesday a national holiday, here are six other NFL coaches who could be presidential material and challenge Ryan for the position. Considered: Jim Mora, just for a press conference in which he says: "The deficit? DEFICIT? I'm just hoping to get gas below $4/gallon." But let's keep this to current coaches. And Chan Gailey. Honestly, he seems like the perfect, anonymous guy at the Iowa Caucus who never stands a chance but gets a brief moment in the limelight. Why he could win: Became the toast of the town after delivering the Saints their first Super Bowl win. Why he might lose: Perceived carpetbagger after moving to Dallas. Why he could win: America loves copycats, and politicians from Chicago have done well in the past. Why he might lose: Do you think the terrorists would respect a president named Lovie? He can't even protect Cutler. Slogan: The only thing we have to fear is the Bears offensive line. Why he could win: Got the Patriots out of a depression and brought unprecedented riches. Why he might lose: But at what cost? Would have been perfect candidate in 2001, now seems somewhat evil. Slogan: Keep America safe with cameras on every corner! Why he could win: Looks like a president with the perfectly quaffed hair. Why he might lose: Well, because he's never won. Slogan: We'll get America into the playoffs â¦ eventually. Why he could win: Revived a sluggish economy (for the players) at USC. Why he might lose: Voters fear he won't have enough institutional control over the economy. Slogan: Fight on! Until things get tough, then I'm out of here. Why he could win: A lack of winning has never kept him from getting any job that he wants. Why he might lose: People are still angry in D.C.
"Pick Six: NFL careers to help get you the gir..."